– In an age when America elected its first black president and the Middle East stirred with popular uprising, Britons were again content to elect the products of their elitist Public Schools. But, their grooming for power aside, does such an education produce excellence – or expertise in self-deception and duplicity? The early 21st Century gives us some clues. Tony Blair maintained his façade of inner conviction but lost the nation through blind allegiance to the Establishment. David Cameron let his boyish mask of caring sincerity slip to reveal a bully’s attitude beneath his meritocratic pretence. A bicycle in Downing Street highlighted a deep-seated problem in Britain: a divided society caught in the enduring trance of the Entitlement Illusion. This specific culture of elitism, protected by financial interests and the “It never did me any harm” syndrome, means that Britain is unlikely to foster the kind of leadership necessary in our world of increasing complexity, which needs a communal mindset and cooperative global solutions. But worse, new scientific evidence shows that this hyper-rational training leaves its devotees trapped within the confines of an inflexible mind, beset with functional defects, presented here as the Entitled Brain. Through the lens of the British case, the author presents readers with a perspective on the universal defects of untempered rationality and proposes a revised model of leadership more fit for the uncertain future our world faces. 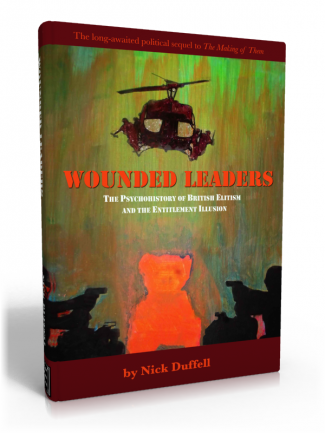 Wounded Leaders: British Elitism and the Entitlement Illusion – a Psychohistory, published by Lone Arrow Press / £20. © 2013 Nick Duffell. All Rights Reserved.